In my beautiful studio in Stow, Massachusetts, which is full of beautiful light, wide plank wood floors, and music. What time are your sessions? My outdoor family sessions take place during the last 60-90 minutes of daylight, which will give your photos a warm, soft, golden glow. We have a little more flexibility with light during indoor sessions, which can typically take place from late morning through the afternoon. 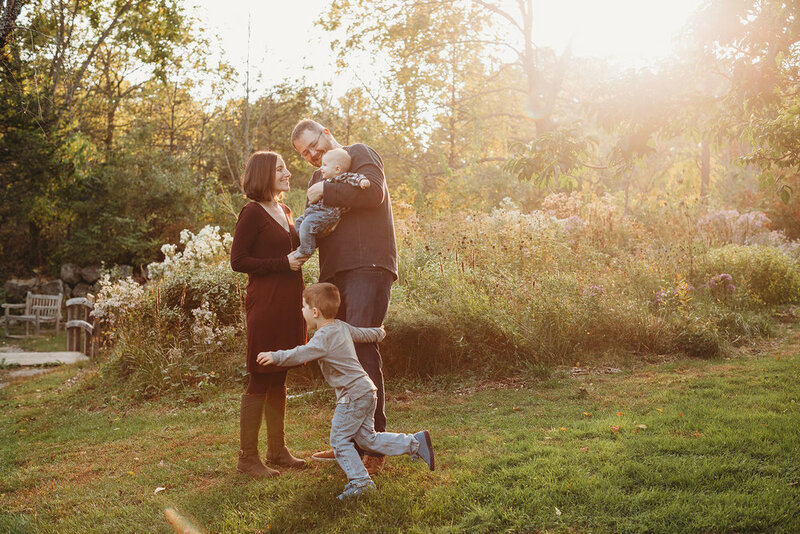 Family sessions typically last about an hour, although a lot of that depends on your kiddos! If they come in happy and excited to take pictures, we might get a lot of good ones up front, and they may be rearing to get on to the next thing within 45 minutes. If your little one has a meltdown, needs a diaper change, or just needs some time to warm up, our session might last an extra 15-20 minutes. What if the weather is bad on the date of our session? *Please note that fall dates book up quickly, but I'll make every effort to reschedule your session to accommodate your schedule. Your experience doesn’t end with your photo shoot! One to two weeks after your session, you’ll be treated to an in-person viewing session of your finished images in my studio. If you’re like most of my clients, you probably want something beautiful to display in your home. I know it can be hard to imagine what you can do with your photographs. That’s why I show you exactly what they could look like on your walls or in an album. Don’t worry, there will be absolutely no pressure to buy anything you don’t want. The reveal and ordering sessions are there to make it simple to preserve the photos that you love. And I always have tea and cake at the ready to celebrate this milestone! I always suggest that you aim to wear clothes that feel classic and timeless, and to wear colors that you know you look good in. Most people look beautiful in jewel tones or neutrals. It's a good idea to stay away from white, which can be harsh on camera, and black, which can make you appear sallow. Above all, aim for comfort! You will be standing, sitting, walking, and maybe even dancing, so wear something that you can move easily in. I would love to work with you! You can get in touch with me through my handy dandy contact form. I'll get back to you within 24 hours.